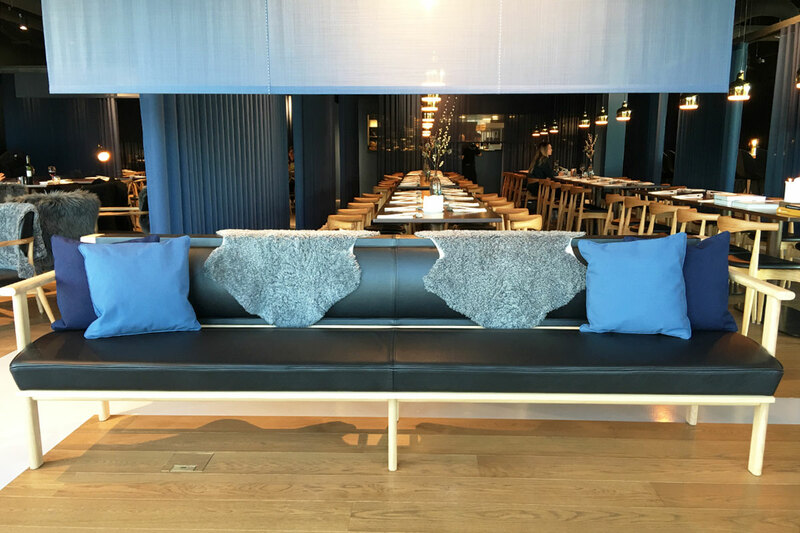 Sticks'n'Sushi designers cleverly partitioned the space with soft drapes forming illusion of walls. 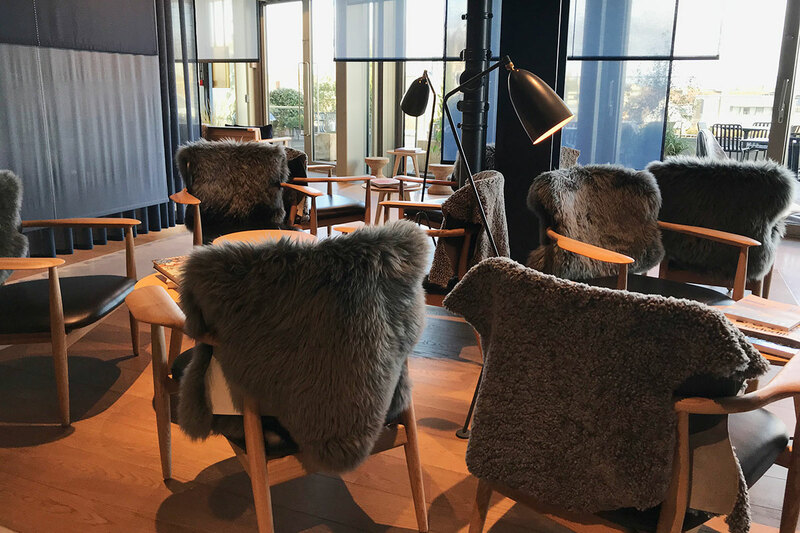 Snug seating area spills out from the bar, for those wanting a more relaxed seating arrangement whilst admiring the views over the city from the rooftop restaurant rterrace. 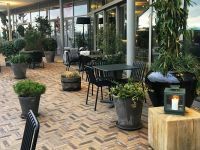 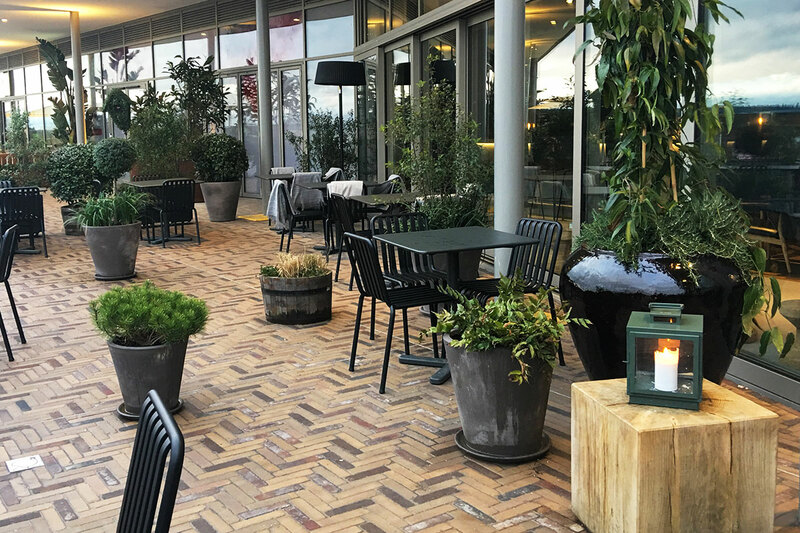 Rooftop is lined with alfresco seating snug amongst the plants and lanterns. 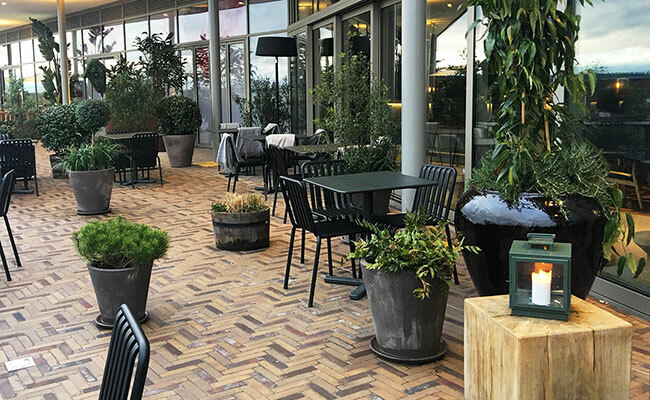 From the terrace walkway there were no obvious external signs, notably due to the Westgate guidelines, which lead us to the fully glazed shopfront for closer inspection. 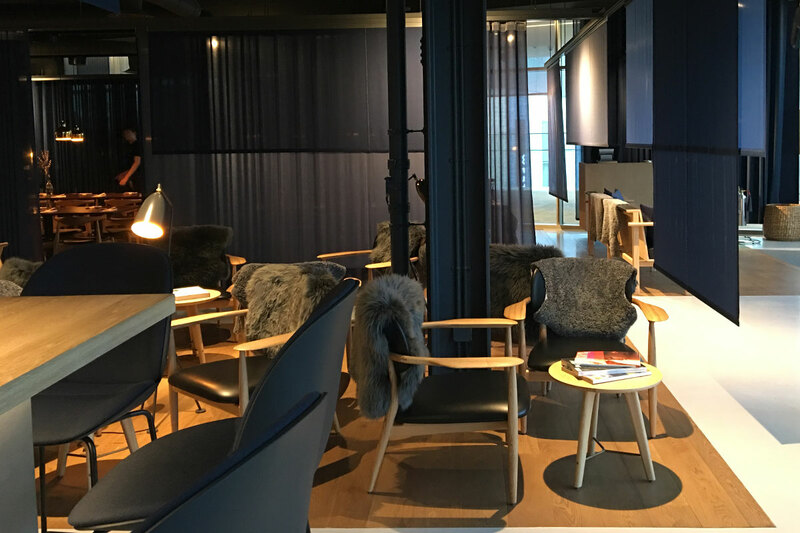 Disguised behind the reflections on the glass was a sleek, showroom like interior with a blue hue. 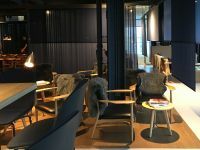 Blenheim Design were welcomed at the door by a friendly male staff member and for a better look at the interior we decided to stay for a quick bite to eat. 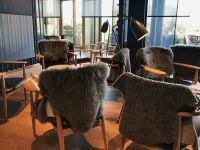 The entrance has a simple meet and greet counter clad in a blonde wood, long leather upholstered freestanding bench seat with scatter cushions in blues and steel grey sheepskins draped over the backrest, small chunky cork stools and round wooden coffee tables in the same blonde wood. 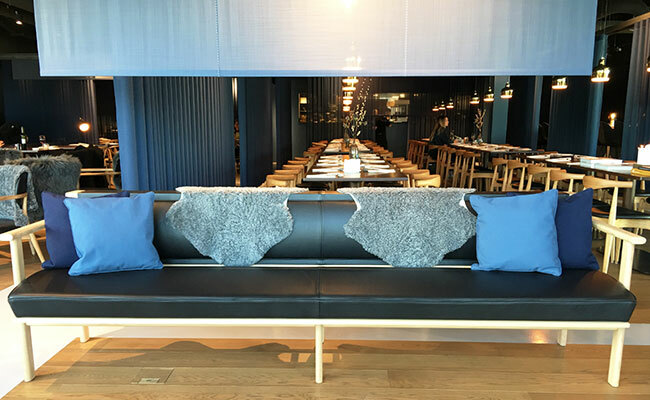 Looking across the interior dining spaces and bar we were taken aback with a sea of blue soft sheer drapery and fabric panels of blue tones, all interlayered and forming soft room separations. 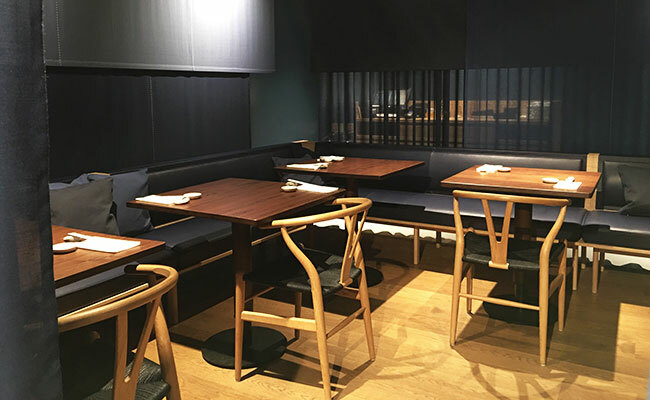 The furniture style blonde woods and colour blue are synonymous with a nordic inspired scheme, but the way the soft furnishings have been hung are reminiscent of a traditional Japanese Shōji (sliding paper screen walls). 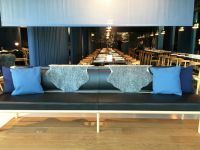 We eventually decided on a comfortable low backed banquette seating adjacent to the front of the bar area and ordered a selection of sushi from the menu in anticipation of the visually creative combinations to arrive. 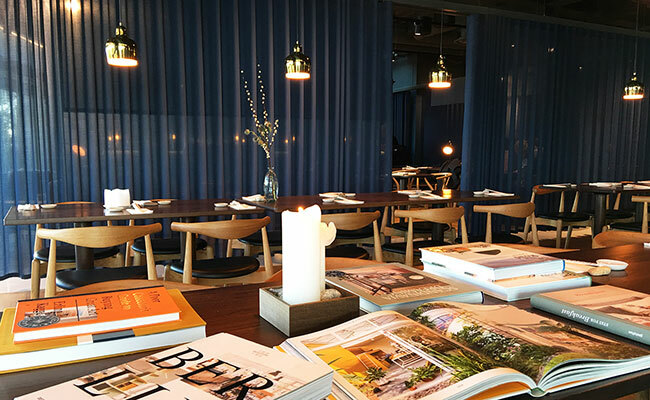 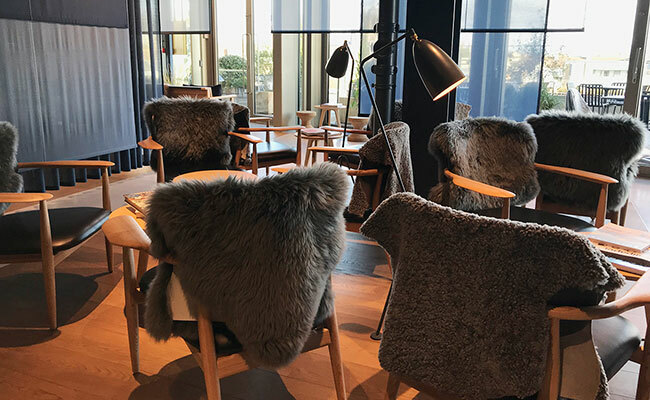 The furniture is iconic Skandi design with more sheepskin throws across the back, it even contains a small library of Scandinavian interiors and designs books and magazines to flip through whilst waiting for a dining table or simply having a beverage. 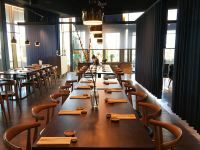 The centre of the restaurant sits in front of the kitchen pass and consists of two long lines of four seater tables with hanging brass Artek A330S pendant lights giving a another focal point and creating pools of light onto the surfaces below. 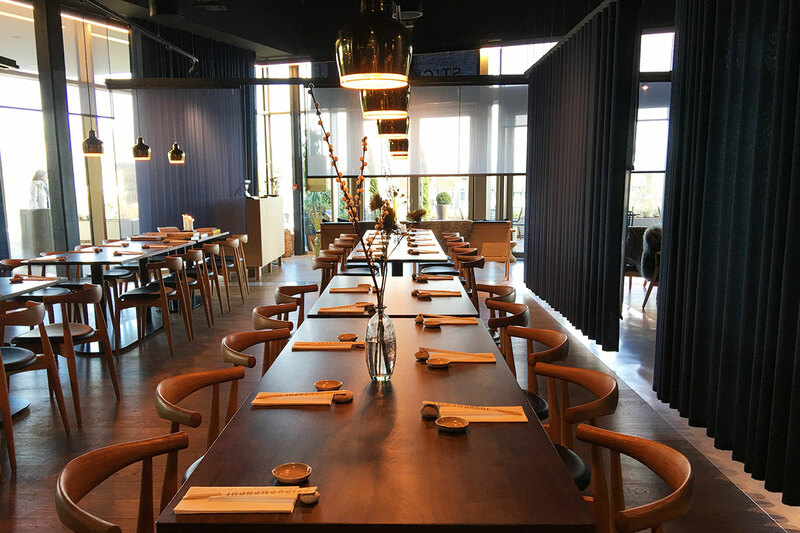 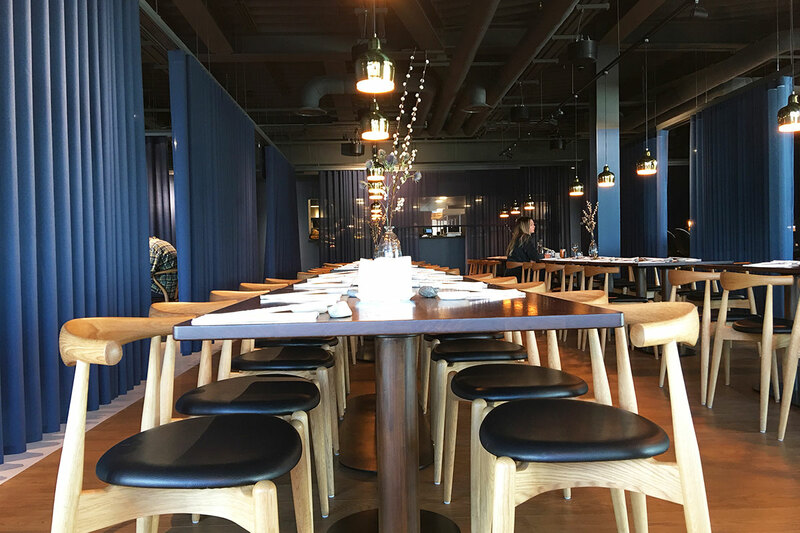 Walnut table tops are used in most of the restaurant and are in contrast to the areas of clear oak timber flooring interspersed amongst the poured white resin floor. 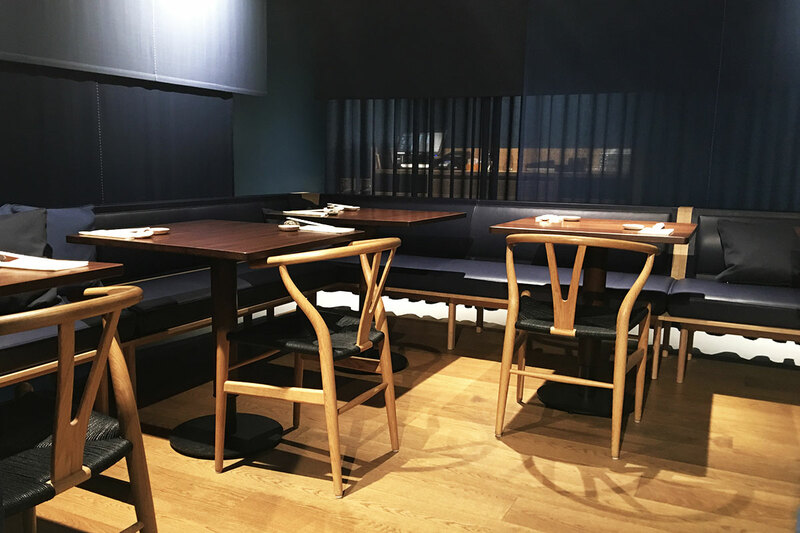 Iconic wishbone chairs in stained beech blend with lighter blonde ash wood furniture. 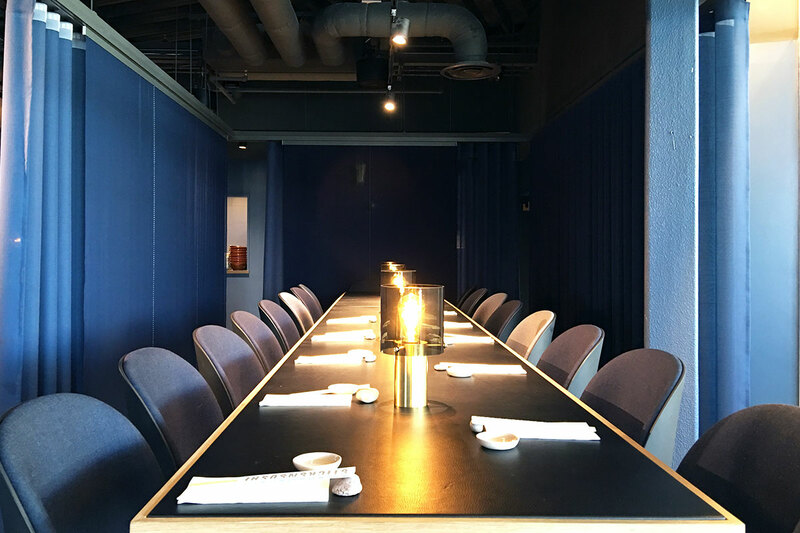 Immediately behind the meet and greet area is a smaller area with another seating arrangement consists of poseur height long table this time with a hard dark surface and oak edge lipping. 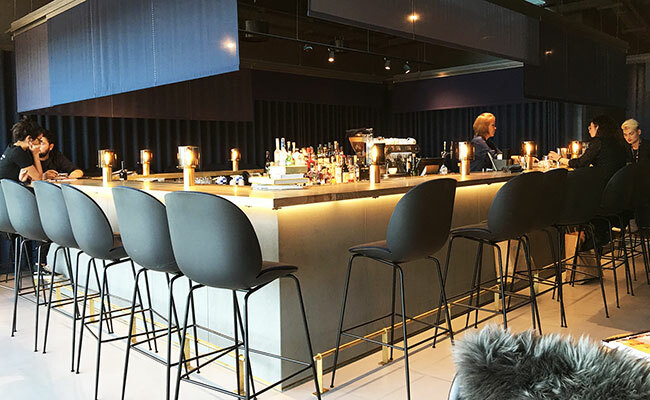 Four brass and mesh lamps fixed to the centre can also be found around the bar as is the same high stool seating. 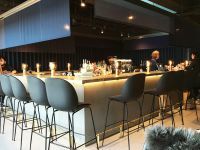 The bar is a simple island finished with grey tile panels and warm glowing perimeter lighting below the oak bartops. 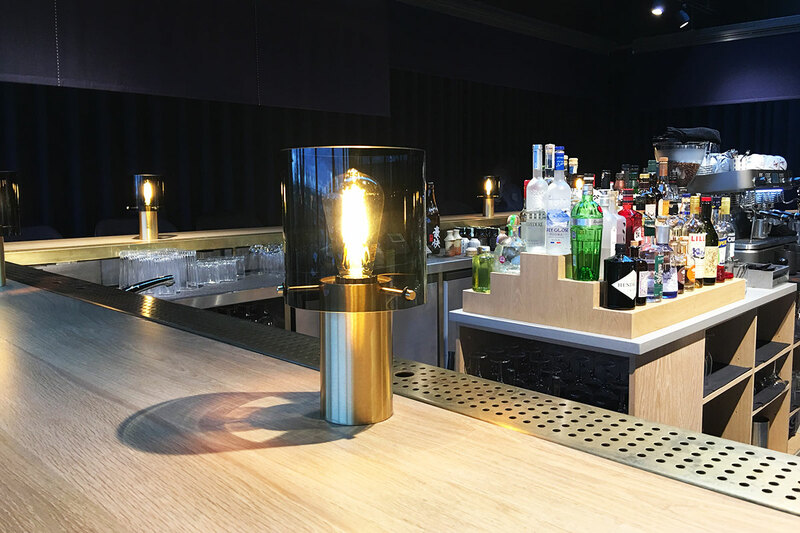 A simple brass footrail stands off from the white resin floor and ties in with the brass table lamps on the bartop. 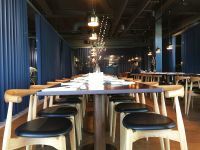 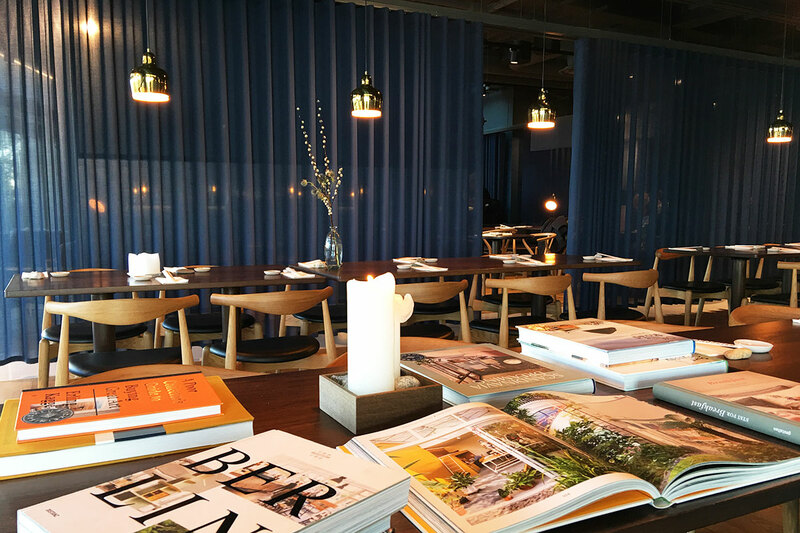 Throughout the restaurant the ceiling slab and exposed services and are sprayed out in a darker blue colour that also extends down the exposed structural columns. 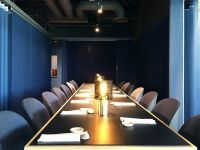 The washrooms are located at the rear of the restaurant through a blue painted corridor leading to a generous communal lobby with an unexpected window view directly looking into the working kitchen of the restaurant, thus creating interest for customers and a different vista for the kitchen staff. 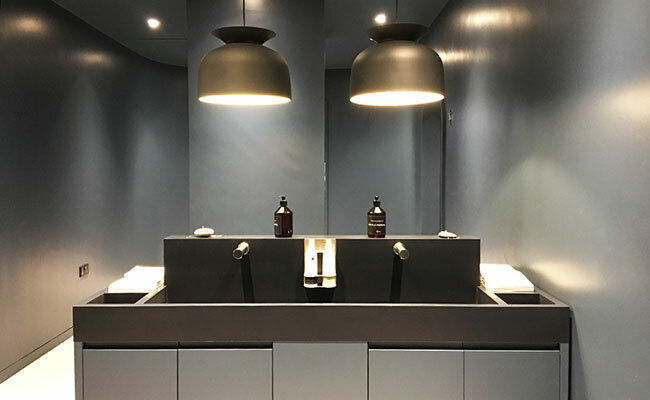 This lobby is very utilitarian in design – it houses the communal hand wash vanity island and off that are arched openings leading to separate male and female toilets in opposite directions. 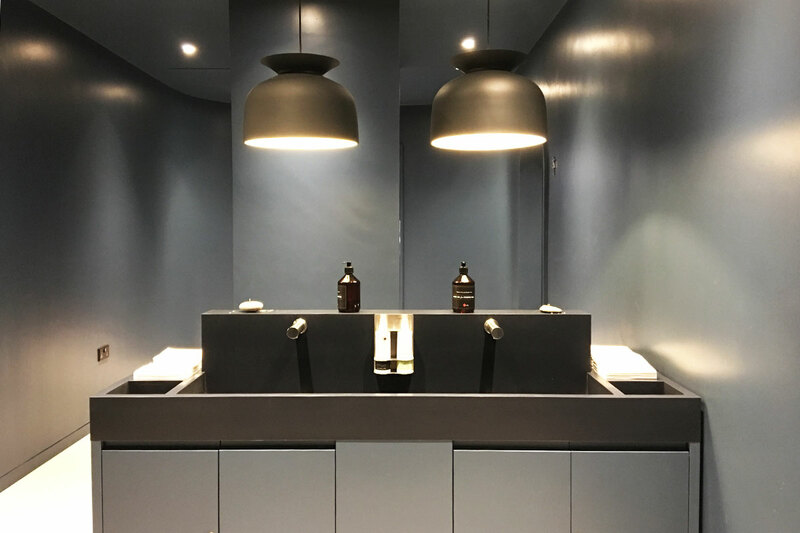 The floor is the same white resin poured floor and although the island vanity cupboard doors are also in matching blue, the dark graphite composite stone trough sink does match with the overhead pendant lighting. 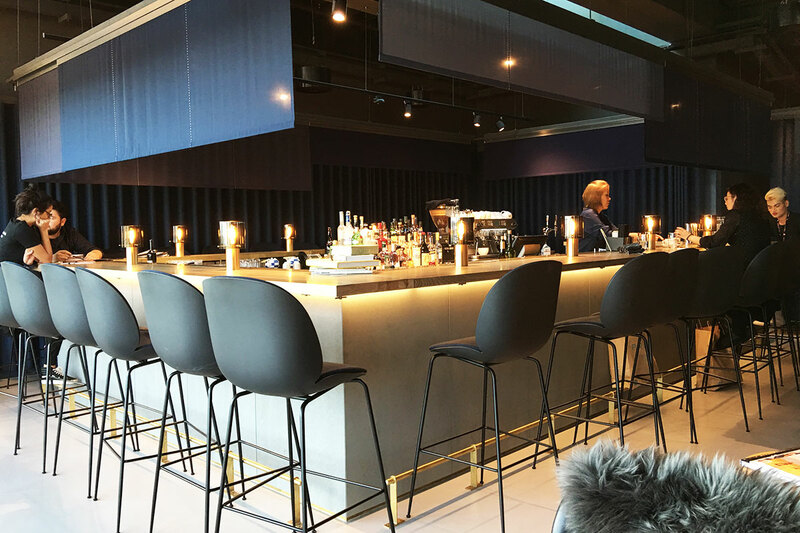 The mid blue paint finish also adorns the doors, arches, architrave, skirting, the ceiling and even extends through to the tiled walls and floors of the toilets. 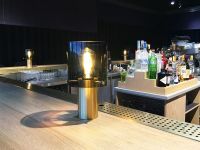 It’s a simple yet impressive effect although I am sure a visually impaired customer would struggle to find their way around with ease. 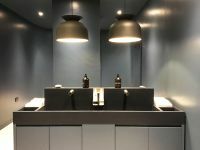 As you would expect in a modern interior the sanitary however is white ceramic and this really stands out from a sea of blue. 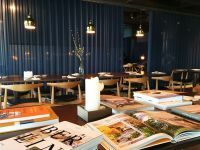 Back at the dining table the food brought out by the friendly staff was too good not to mention in this review. 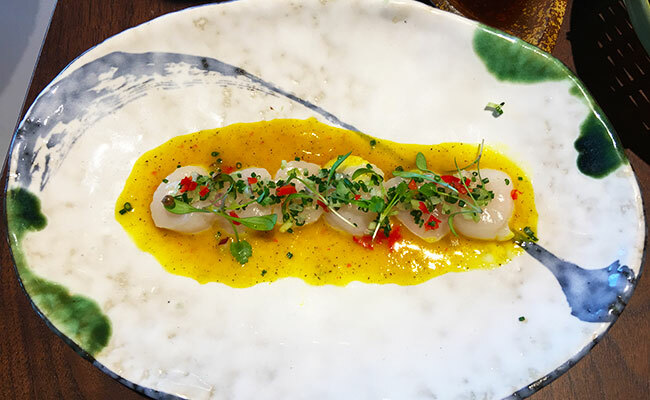 The colours and combinations of the dishes were artistically presented as well as emanating glorious smells only found with freshly prepared sushi. 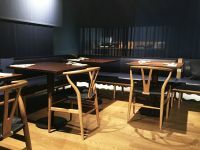 The flavours and textures were harmonious and I would describe the menu as a unique blend of traditional and modern techniques. 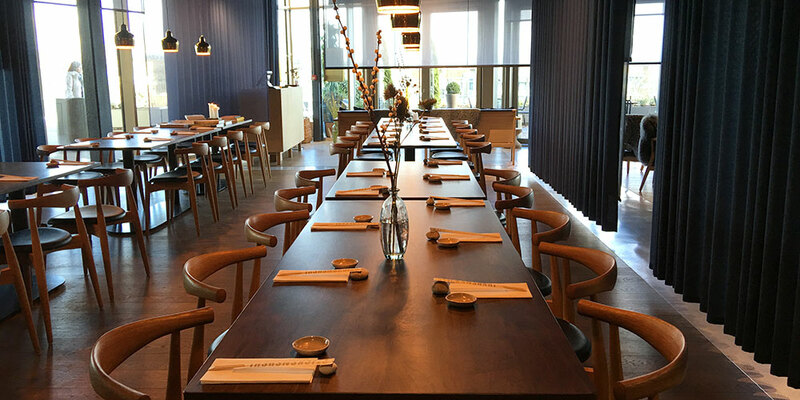 Sticks n sushi is well worth a try if looking for something special and the budget is not too much of a concern.